In order to provide for the safety of Ocean Isle Beach guests, to allow police and fire personal to respond to emergency calls and to adhere to Federal laws regarding OIB's classification as a Sea Turtle Sanctuary, the Town of OIB has the following ordinance regarding the placement of items on the beach. 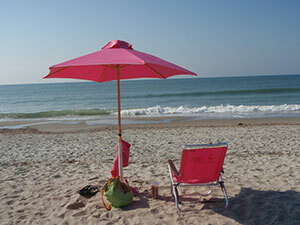 ABSOLUTELY NO CABANAS, CANOPIES, TENTS OR AWNINGS ARE ALLOWED ON THE BEACH AT ANY TIME. Any items left unattended and remaining on the beach between 7:00 p.m. through 7:30 a.m. will be classified as abandoned and removed and disposed of by the Town. All beach equipment shall be set at least ten (10) feet from any sea turtle nest or dune vegetation and can not be placed seaward of the nest. Failure to comply with these regulations will result in a civil penalty of $50 for each offense. In order to comply with North Carolina State Law, all vehicles operated on any highway within the State must be registered. A golf cart is a vehicle for purposes of this law. In order to register a vehicle, the owner of the golf cart must have liability insurance and the golf cart MUST be street legal in order to be operated on state and town roadways. The golf cart shall have the required equipment as set forth below. A golf cart may ONLY be operated on streets and highways where the posted speed limit is 35 miles per hour or less. Please take notice that our Police Department will be addressing owners of golf carts in order to ensure that these low speed vehicles comply with State Law. In addition, ALL OPERATORS OF GOLF CARTS MUST HAVE A VALID DRIVER'S LICENSE. All low speed vehicles shall be equipped with the following equipment in order to comply with North Carolina State Law and the United States Safety Standards: Headlamps, Stop Lamps, Turn Signal Lamps, Tail Lamps, Reflex reflectors, Parking Brakes, Rearview Mirrors, Windshield, Wipers, Speedometer, Seat Belts, Vehicle Identification Number. All dogs must be leashed or fenced at all times. NO DOGS allowed on beach strand from 9:00 a.m. to 6:00 p.m. from Memorial Day to Labor Day. No dogs allowed at any time in Public Access/Parking Areas. Pooper Scooper Ordinance in effect. You can view more information about the Ocean Isle Beach, North Carolina and the rules and regulations from the Town of Ocean Isle Beach's website.